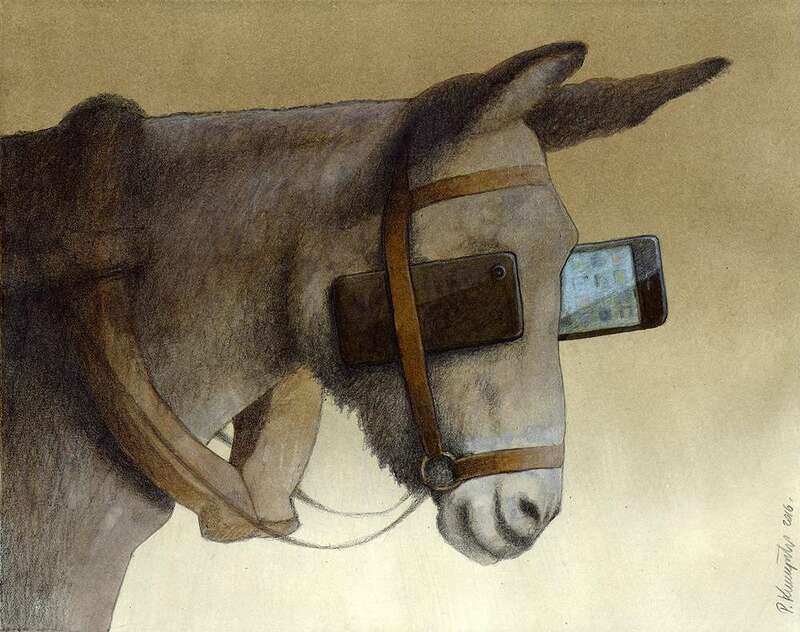 “Pearl.” The art in this blogpost is taken from Pawel Kuczynski, a satirical artist from Poland. Every year, Citizens commits to a handful of goals and prayers. Our church can’t mature all at once, so it makes sense for us to focus on just a few areas of growth each year. At last week’s Vision & Prayer meeting, we reminded members about our four 2019 goals and then I took some time teaching through our third goal: to commit ourselves to basic, Christian spiritual disciplines (of Word, prayer, and fellowship). Why is this goal important to Citizens? Most Christians agree that spiritual disciplines are important (even if most of us struggle to do them regularly). It’s unsurprising for pastors to tell their people to read the Bible and pray and go to church. Isn’t that what we’re paid to say? But, for C.J. and myself, this is no generic goal. We are increasingly convinced that Citizens Church will not survive without a mature leadership and increasingly mature membership. Citizens will not thrive. We will not grow. We will not multiply disciples. We will not accomplish our vision or measure up to any of our distinctives if our faith is not exceptionally strong. We are just up against too much in this city. Life in San Francisco is hard. Satan’s grip here is strong. We will not make a gospel-sized impact on San Francisco if we are not allowing God to make a gospel-sized impact on us. We need strong faith, and the God-ordained means for strong faith is the regular pursuit of spiritual discipline. We don’t need a new strategy or technique. We just need to commit ourselves to the boring, slow, unimpressive, mundane, centuries-old habits of grace. Maturity only happens in people who are consistently engaged in Scripture, prayer, and fellowship. As David Mathis writes in Habits of Grace (free download or purchase), Christians must “hear God’s voice, have God’s ear, and belong to God’s body.” There’s simply no other way to experience closeness with Christ and to become more like him. It’s not about guilt or shame; it’s just the way our relationship with God works. But why are spiritual disciplines so hard today? I’m sure that spiritual disciplines have been hard in every generation. The Proverbs are proof that laziness and misplaced priorities are ancient problems. But I think there is a case to be made that spiritual discipline is especially hard today. Clearly, this is not just a problem for our professional lives. This is also a problem for our spiritual lives. We’re not just talking about Bible reading and prayer, either. All aspects of Christian living are compromised—relationships, community, hospitality, deep conversation, evangelism, sacrificial living, worship. To meaningfully engage in these fundamental human activities, I need full presence. (And I need the full presence of others.) Following Jesus is deep work. We cannot do deep work while being distracted. Practically speaking, at a minimum, this means that Christian practice should mostly be device-free zones. When praying, I don’t listen to music because I inevitably want to switch songs or adjust the volume a dozen times. And, of course, silence and solitude must include digital silence and solitude. Corporate disciplines are also best experienced device-free. Studies have shown that even having a phone upside-down on a table inhibits deep conversation. And be honest: When was the last time your relationship with someone was furthered by something someone shared from their phone? Did it serve the time, or did it fill a silence that left lingering would have resulted in something deeper? And, in case you’re worried about being out of reach, when was the last time you were interrupted by something that truly couldn’t wait till the end of lunch? It’s amazing how much the thought of being phone-less scares us. A ridiculous survey in 2018 found that 23 percent of young adults would rather give up one of their five senses and 10 percent would rather lose a finger than give up their phone. Of course, that’s a silly question that we’ll never have to actually answer. But deciding between our devices and our capacity for depth and maturity—that is a fair question we all must answer. If we don’t decide ourselves what we want from life, our lives will be decided for us by corporations which care nothing about our relationship with Jesus. We’re asking members to pick a few disciplines to invest in between now and our next Vision & Prayer (in June). Using the categories of Scripture, Prayer, and Fellowship (hearing God’s voice, having God’s ear, and belonging to God’s body), what are 2-3 practically steps can you take to increase your faith and move closer to Jesus in 2019? And what if you did them without any distracting devices nearby? None of this is fast or flashy, but it will bear fruit. By putting yourself expectantly in the way of grace, you will personally grow in Christ (and grow happier in the process). Citizens will mature, and we will see the Kingdom of God advance in San Francisco.